A high-end spotting 'scope without the high-end price tag, the new Vortex Viper HD 15-45x65 Spotting Scope series offers highly competitive features and food for thought when choosing a new scope within its price bracket. 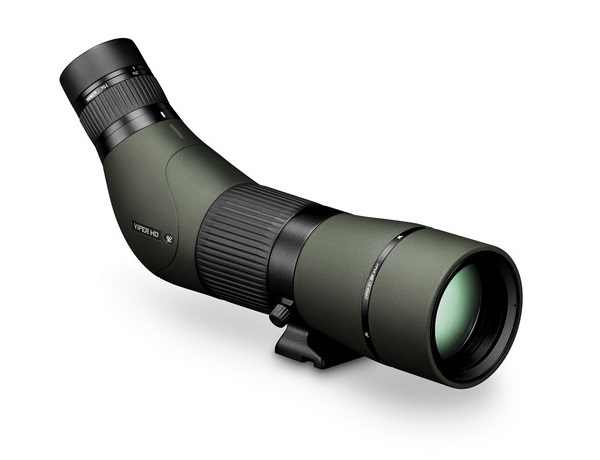 HD Lens Elements - Optimised optical system delivers impressive resolution, cuts chromatic aberration and provides excellent colour fidelity, edge-to-edge sharpness and light transmission - resulting in High Definition views. XR Lens Coatings - Vortex proprietary coatings increase light transmission with multiple anti-reflective coatings on all air-to-glass surfaces. Dielectric Prism Coatings - Multi-layer prism coatings provide bright, clear, colour-accurate images. Angled Body Design - Valued for allowing an overall lower mounting height which maximises stability in wind, offers greater comfort when viewing for extended periods, and permits the use of a smaller, lighter tripod. ArmorTek - Exterior lenses are protected by ArmorTek - an ultra-hard, scratch-resistant compound that repels oil, dirt and the corrosive salts of fingerprints. Adjustable Eyecup - Twists up and down to precise 'click-stop' settings for comfortable viewing with or without spectacles. Helical / Barrel Focus - New Dual geared focus system allows for fast yet precise adjustments. Rotating Tripod Collar - Allows rotation of the eyepiece to a sideways position - most useful for viewing through an angled spotting scope body on a car window mount.